This month the volume Screening the Golden Ages of the Classical Tradition was published by the University of Edinburgh Press. My chapter in that volume explores how an episode of the ’90s television series Hercules: the Legendary Journeys creates a complicated kind of nostalgia--not the usual rose-tinted glasses view of the past-that-never-was. The episode “Once a Hero” is a “sequel” of sorts to the Jason and the golden fleece legend: a decade after the Argonauts’ successful taking of the fleece from Colchis, a new enemy is able to steal it from Jason’s throne room. This happens because Jason is a shadow of his former self: he’s an alcoholic barely hanging on to his kingship. With the help of Hercules and the other Argonauts, though, Jason returns to his heroic identity. At some point or other I decided to cut a discussion of how the series depicts the appearance of ancient Greece in unique ways. Other pop culture representations portray ancient Greece with white marble statues (see Sarah Bond‘s excellent article in Forbes on polychromy in the ancient world), buildings with columns, people in chitons/togas, and so on. Examples include Alexander the Great(Rossen 1956) and Bill and Ted’s Excellent Adventure (Herek 1989), in which white men in equally white chitons speak to each other in buildings and among statues of white marble (see header image). But Hercules: the Legendary Journeys derives the visual look of its ancient Greece from several different cultures, which reflects the trends of globalism and multiculturalism in the popular media culture of the 1990s. This came about in part because the series was filmed in New Zealand, had a tight budget, and needed a new episode almost every week. Another source was tradition. Despite falling into many of the traps of stereotypical representation of the ancient world, the sword-and-sandal (or peplum) genre of films in the 1960s and beyond also created a globalized ancient Greece. A producer of Hercules: the Legendary Journeys, Rob Tapert, saw these peplum films as his inspiration, as indicated by the quote from a 1996 interview with him that prefaces this post. These films were typically produced for very little capital on location in a matter of weeks for immediate release and (hopefully) a quick profit. Figure 1: Iole sings to Hercules and Ulysses as they ride in a covered wagon on their way to Thebes in Hercules Unchained. Note the generic “ancient Greek” dress that Iole wears in this scene as well as the lyre that she strums, in contrast to the Western covered wagon. Iole sings the song “Evening Star,” which in the film is dubbed by June Valli, a television personality who often dressed in western clothing in her appearances (compare her similar-sounding song “Don’t Let the Stars Get In Your Eyes”). One way that peplum filmmakers streamlined the production process was to re-use props from previous cinematic productions. In 1959’s Hercules Unchained, for instance, the titular hero, his wife Iole, and their traveling companion Ulysses journey from Iolchus to Thebes in a covered wagon, reminiscent of the ubiquitous conveyance of another popular film genre produced in Italy around the same time, the spaghetti western (see figure 1). This production aspect also resulted in a narrative that had multiple layers of culture. 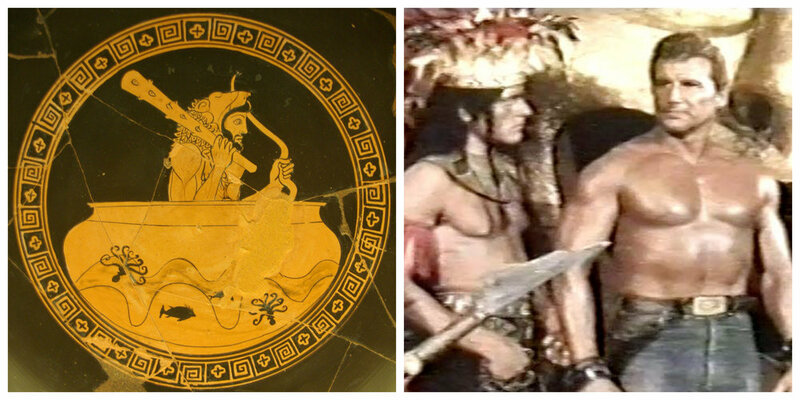 Figure 2: On the left, Hercules sails to Spain in the god Helios’ cup; on the right, Hercules faces Aztec warriors in Hercules Against the Sons of the Sun (Civirani 1964). Another feature of peplum films that added to their multiculturalism was their settings. Although some films, such as the aforementioned Hercules Unchained, set their stories in Greece, others placed their heroes in wildly different contexts, such as sixteenth-century Spain in Hercules and the Masked Rider (Pierotti 1963), ancient Babylon in Hercules and the Tyrants of Babylon (Paolella 1964), and the new world in Hercules Against the Sons of the Sun (Civirani 1964). Spain isn’t too much of a stretch even for the ancient stories about the hero, which depicted Hercules traveling to Spain to steal the cattle of the three-bodied giant Geryon for one of his labors (see figure 2). This diversity of the times and settings of the films’ storylines was paralleled by the polyglot peplum film sets. Peplum films typically employed actors of multiple nationalities speaking their native tongues that would later be dubbed over for whichever market the film was being released in. In Hercules Unchained, for instance, Hercules was played by the American Steve Reeves, Iole was played by the Croatian Sylvia Koscina, Queen Onfale by the French Sylvia Lopez, and Ulysses by the Italian Gabriele Antonini. You can often tell which actors are speaking different languages in the English dub, because their mouths don’t even come close to matching the dialogue. Figure 3: In the Hercules: the Legendary Journeys episode “Once a Hero,” Jason’s palace at Corinth is decorated with strings of red Chinese paper lanterns and has a window decorated with Chinese ornamental designs. Hercules: the Legendary Journey’s eclectic mise-en-scène parallels that of peplum films, for reasons both of recalling its roots in that genre as well as for reasons of economy and the fast production schedules of serial television. The series evokes medieval fantasy, with villagers’ thatched huts and rulers’ imposing castles, and characters often wear loose tunics and trousers. This vaguely western European flavor is mixed with martial arts fighting styles and actors of a variety of ethnicities, from (in this episode at least) the Caucasian Kevin Sorbo (Hercules) to the African-American Anthony Ray Parker (Valerus) to the Europe-born New Zealander Jeffrey Thomas (Jason) to the Maiori Mark Nua (Otus) (see header image). Architectural elements often evoke an Asian context; in “Once a Hero” Jason’s palace has windows with ornamental designs of the sort seen in Chinese gardens and is festooned with strings of paper lanterns (see figure 3). At the same time, stereotypical ideas about the appearance of ancient Greece are also evoked by a CGI temple pediment on the palace’s roof (see figure 4). Figure 4: In the Hercules: the Legendary Journeys episode “Once a Hero,” The apex of Jason’s palace at Corinth is a stone pediment of the kind we typically see on ancient Greek temples. The pediment is triangular with figures--it’s difficult to make out what they are, though it looks to me like this was inspired by a photo of a real pediment and then stylized for inclusion in the series. I mentioned earlier how the series’ roots in the peplum genre--tradition--were responsible for some of this multicultural presentation, but another equally important factor was changes in the global production and distribution of television in the last decade of the twentieth century when Hercules: the Legendary Journeys was created and broadcast. In the chapter “Xena: Warrior Princess” of the book Essential TV Cult Reader, television scholar Carolyn Skelton describes how the political, economic, and cultural milieus of the early 1990s affected the presentation of the “geographic and culturally fragmented fantasy world” of the television series Xena, and because Xena spun off of the first season of Hercules: the Legendary Series, I would argue that these circumstances were also true of the parent series. By mixing and matching cultures, times, and places, Hercules: the Legendary Journeys challenges what its audience expects ancient Greece to be like from earlier popular media. Part of this is due to the traditions of peplum films, but part of it can be attributed to the then-dominant multiculturalism and globalism of the mass media in the 1990s. The series thus takes elements of its audience’s late-twentieth century present and retrojects it onto the ancient Greek past.